I really should buy the first issue, as it is the only one I’m missing, thus far. Groot is on Earfk, a small planet (possibly a moon) that appears to be only a gas station. We are introduced to creator find of 2015, Mantron. A robot that was built to the pinnacle of earthdate 1996 technology. Mantron, is pretty awesome. The pull out ads are for – Amazing Spider-Man 1, Doctor Strange 1, Marvel Point One Avengers 1 and Avengers 0. I saw that in Marvel Point One, Maestro (a future Hulk) had Illyana’s soulsword, strapped to his back. Should I buy that, just because it has Illyana’s soulsword or does that not count as an appearance of her? I figure I should buy the issue that they specifically call it Illyana’s soulsword but then, do I go back and get this issue? I’m not sure. The Skrulls from previous issues; Laz and the other two; come raining down. Mantron flips in his battle floppy disk. It takes too long to load but the Skrulls turn on Laz, as they thought they were on Earth. It happens, that the name is really hard to read, on a map. The Skrulls feel like they continue to disgrace their race. Mantron is about to attack the Skrulls but Groot moves his cannon gun out of the way. Groot recruits the Skrulls and Mantron decides to come with them, as well. Who appears in this issue and in Power Pack 51, as well as the Official Handbook of the Marvel Universe ’89 5. Apparently she was modeled after Whoopi Goldberg. I guess she has the ability to influence wonder, opportunity and chance. Or something like that, she seems overly cryptic. 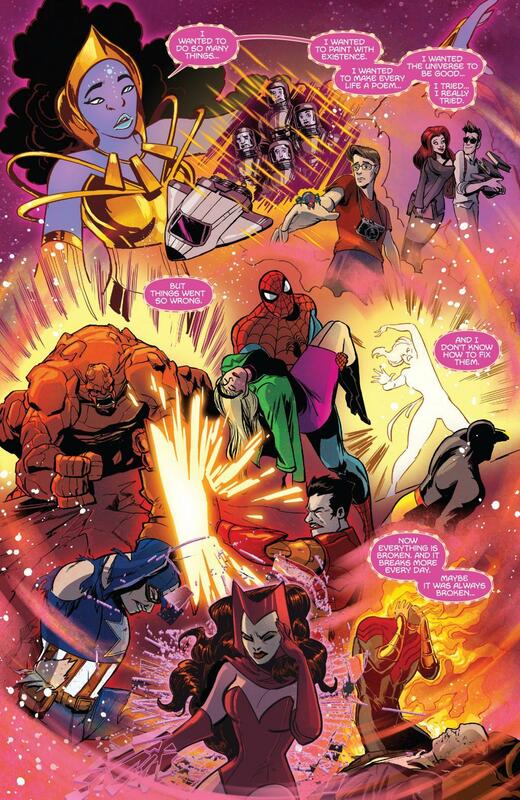 We are shown the Fantastic Four, mid-cosmic ray bath / Peter Parker, mid-spider bite and Jean flirting with Scott. Scott, gets a trilogy moment. We get Kesinger’s take on the Thing, which seems off model and villainous but I can go with it, as we are shown five tragic moments. Well, six, I suppose as Ben Grimm didn’t want to become the Thing. Gwen Stacy’s death, The Phoenix Force as Jean Grey’s death. Captain America v Iron Man, during Civil War – which we are apparently getting a sequel (of sorts) just in time for the film – Captain America : Civil War. Wanda, which assume is No More Mutants, related and finally, Scott killing Xavier at the end of AvX 11. Groot assures her that things are okay. We are treated to scenes with Captain Marvel, Ms. Marvel and Spider-Man. Steve Rogers saluting FalCap. Reed and Sue with their children, Franklin and Val. Miles Morales, a flashback from Astonishing X-Men 51, with Northstar and Kyle’s wedding. Thorster, is the nickname I’m going with. Quill proposing to Pryde, which is why I bought the issue. Nova is thrown in as is Thing and Alicia Masters. Numinus agrees to help, so the entire team is off to save Rocket. The Skrulls don’t do a good job of infatuating the base – largely due to Laz’s lack of control over his shape shifting abilities. The team charges at Eris but everyone trips over Numinus’ dress. Eris and her gang do a decent job of keeping Groot and his team, off of their feet. There is another set of pull out ads. Invincible Iron Man, FalCap, Astonishing Ant Man, Angela Queen of Hel and Contest of Champions. I’m only interested in Contest of Champions, as Maestro is carrying Magik’s soulsword, or maybe it is a regular soulsword, I’m not sure. In a very fun sequence, Numinus (further adding to her power description; she is – chance, fate and existence. Numinus blasts mist at Eris and that gives her hiccups. Mantron needs to be rebooted. 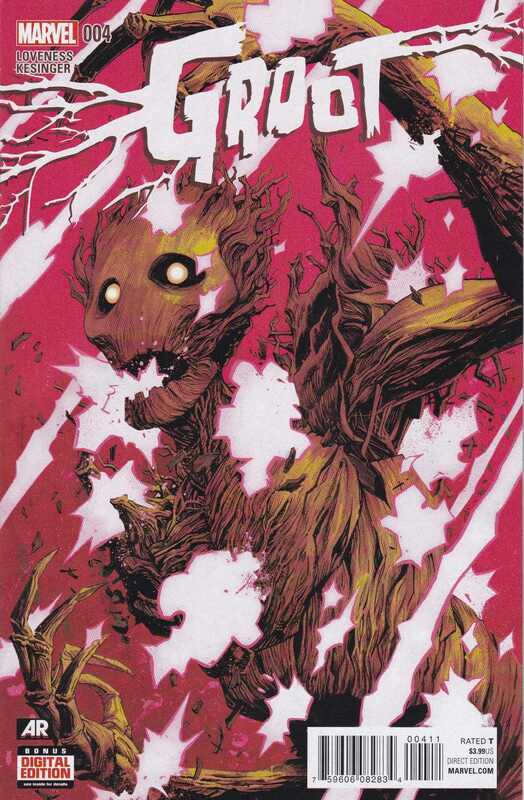 Groot strikes Eris and she shoots him with a fancy gun that causes Groot to explode. 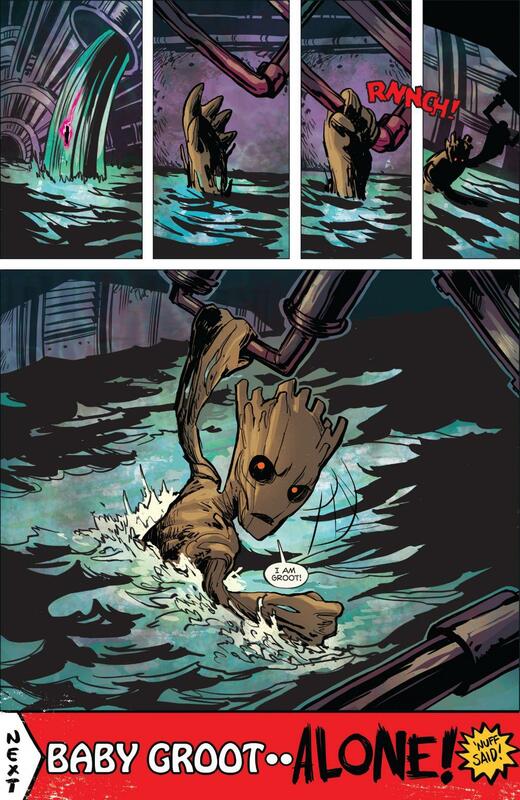 Eris tells her crew to burn everything and this separates them from Groot’s team. Well, Rocket’s team now, I suppose. Numinus saves the team and they flee. Such a nice homage to Wolverine from Uncanny X-Men 132. Baby Groot is back! 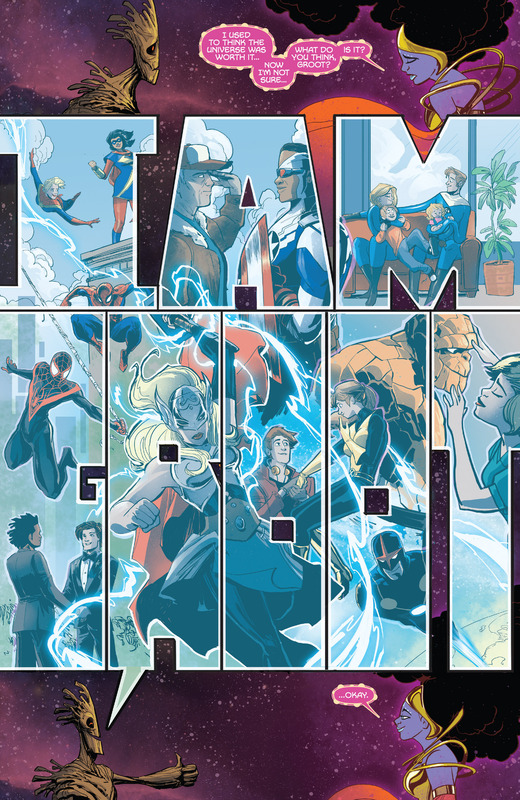 I can imagine that there will be a reason for me to buy the next issue but this is a pretty good series, thus far.